Not long ago we were celebrating St. Patrick's Day, jiggling and reeling in an Irish style to the sound of traditional Irish music. But while outsiders listen to it as exotic and captivating music by the traditional instruments used and the “magic” sounds produced by those instruments, Celtic music transcribes many valuable stories that resume the cultural identity and heritage of the Celtic nations: souls abundant of emotions. Geographically bordered, this music genre, covering a spectrum from pure acoustic folk to folk rock, etc, becomes global in this great little virtual world, bringing communities together to celebrate whatever occasion to the rhythm of the distinctive sound of bagpipes and the vigorous drumming. Better than an energy drink, it will make you dance until you fall off your couch. 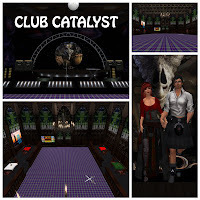 To better understand what Celtic music and Connection Production is we have talked with the owners, Brielle Coronet and Rik Xaris, here as CCP, who also own Club Catalyst. SLE: Could you tell us what is Celtic Connection Production? 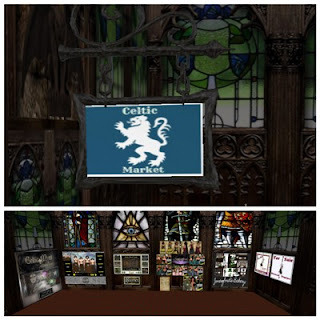 CCP: We created this company in 2010 as a one stop source for Celtic music fans in Second Life. Through CCP people can find out about events, such as when our bands are playing, piping shows and other Celtic events either at our club, "Catalyst" or at other venues. SLE: What are the bands that you work with and how do you describe their music genre? CCP: We have several bands that are in current rotation: Aurum Aquila is a medieval style pipe and drum minstrel band that shares music from the Celtic nations and beyond with exotic sounds of the Middle East. The band is very popular at role play venues and other medieval events; Drones & Drums showcases the music of several real life bands: Celtica, Prydein, The Rogues and Tartanic. We describe the resulting mix of their music as "pub style" Celtic rock with guitar, song and piping; Saor Patrol is a charity band with a mission. 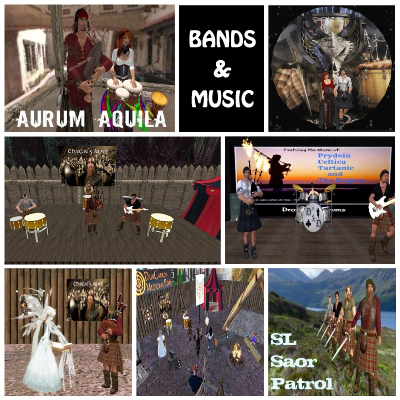 In early 2012 we approached Charlie "Chick" Allan, band leader of the real life band with an idea about sharing their music with a Second Life band for the purpose of raising awareness about the DunCarron Fort project and promotion of Scottish heritage. In return for the partnership, we pledged that 100% of all funds raised in SL would be donated to the Trust. In addition, Rik Xaris performs solo piping shows for concerts and special occasions, such as weddings. He is a real life pipe major from Scotland and enjoys sharing piping. He even includes some original tunes. SLE: How could you get the licenses from the bands to use your music in Second Life? CCP: We wrote letters to all the bands asking permission to use their music in Second Life for the purpose of sharing quality Celtic music. We report back to the bands on a regular basis to give them updates about our activities. The bands were very enthusiastic about being represented in Second Life. At each show we offer information about the bands and their websites so people can become fans and enjoy more of their music. SLE: Do you have in perspective to increase the portfolio of bands? CCP: We will concentrate on the bands we have just now but who knows what the future might hold. SLE: As you said, Saor Patrol’s profits go to charity. Could you tell us what is DunCarron Fort and how are the funds raised used? CCP: The Clanranald Trust is currently building a full-scale replica of an early Medieval Motte & Bailey Fort called DunCarron located in real life Carron Valley Forest, Scotland. The fort is typical of a Scottish Clan Chief’s residence and is an authentic living medieval working community. We are in close contact with the real life band. We recently donated $250. US dollars to their Clanranald Trust which was earned from all our Second Life shows. DunCarron Fort in real life offers interactive historical experiences for students and tour groups through its learning environment, such as with hands-on activities, craft work, re-enactments, and teaching general living skills typical of the people of these times. The funds we raise in SL are donated to help the Trust towards fulfilling this vision. SLE: Do you consider having a replica of Duncarron Fort in Second Life? CCP: We were lucky enough to be invited to the SL10B event where we had a replica of the Fort and we were amazed at the interest shown and the number of questions asked. We now have a permanent location for Duncarron which can be found in Search under Places. SLE: What kind of events do you host? 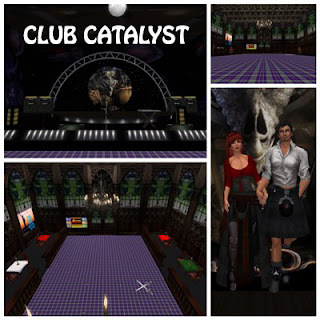 CCP: CCP also includes in its roster, the all-Celtic music club, Catalyst. This Celtic themed club plays Celtic music genres, such as Scottish and Irish from traditional to rock. On most nights the club is filled with people with kilts, sword dancing and friendship. Its PG styled and all are welcome. We have a variety of Djs and hosts from Scotland, Ireland, and America who play Scottish and Irish music. When there aren't DJs, a Celtic music stream is always playing. Many people enjoy coming and listening to the music even if there isn't an event going on at the time. You may also hear the sound of the Great Highland Bagpipes from Rik and his friends at various functions, such as SL weddings, birthday parties or just a wee gig at the club with some of his original music written for special folk in sl. SLE: What would you like for the SLE readers to know about both the tribute bands and your club? CCP: Our goal is to create awareness and appreciation for Celtic music, and most especially, Scottish heritage, culture and music through a variety of fun venues. SLE: Thank you so much Brielle and Rik for your time and for the kindness with which you welcomed us in your venue. CCP: Thanks for allowing us to share about Celtic Connection Production. Wow, excellent article!! And so nice to see you guys covered here. I hope the journey will go on for much longer, please never quit doing your awesome shows! Brielle and Rik perform regularly at Rainbow Gardens Pet Memorial Center. Their music is great. All the bands are wonderful, and the Tinies are adorable! Aurum Aquila performs on a bi-weekly basis in the Realm of Usk, virtually making our Usk Market Day event a success while bringing a constant flow of of new friends to our 14th Century Medieval Realm set in Wales. While Brielle and Rik entertain Usk's Market with a flow of magnificent Pipe and Drum music, Market Day participants; shoppers (purchasing items actually for sale and usable in roleplay) and vendors dance and make merry making the event a total success. Usk is honored to call Brielle and Rik members of the Usk family. Excellent interview! 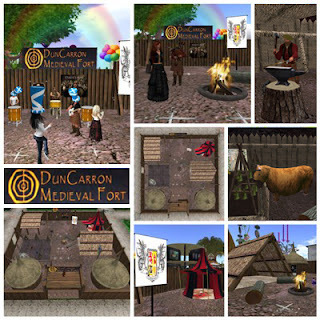 It's awesome that Brielle and Rik are carrying forward the Duncarron project into SL, in addition to their advocacy for good quality Celtic music. Thanks for sharing with us! I have known Brielle a very long time, we have shared professionally and I know her enthusiasm and commitment to second life projects is phenomenal. Since she teamed up with Rik they have formed a strong foundation to maintain a Celtic presence. Rik is a professional piper and he knows what is excellent and thus promotes this. Besides they are a fantastic couple, and provide a welcome to any sim they are on. Fantastic project and a truly great couple . It has been my honor to enjoy and watch the ongoing progress of this Celtic celebration for some time in Second Life. In my over six years of experience with SL , there have been few others with such love and dedication to a cause. Well done Rik and Bri ! Uxor Uggla ( Glen Owen ) Love from Canada. Very awesome place, Brielle and Rik provide great entertainment, and, I know lots of people appreciate it. Keep up the good work.